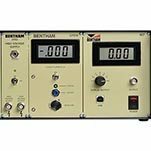 The 215 high voltage supply offers a stable high voltage source for use with detectors. The 218M optical chopper and control module enables light source amplitude modulation for applications in the infrared with high ambient illumination. The 275 is an ultra-low noise voltage pre-amplifier module designed for use as the lock-in amplifier front-end for Mercury Cadmium Telluride detectors. 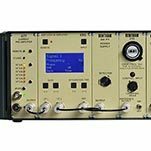 The 417 detection electronics mainframe is a customized optical detection system designed for automation of high performance light measurement systems. The 474 transformer and amplifier module is used as the lock-in amplifier front end in AC systems. The 477 dual channel AC current pre-amplifier module is used as the lock-in amplifier front end in AC systems. The 487 dual-channel picoammeter module is used as the data acquisition interface in DC systems. 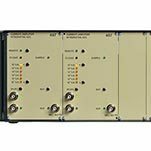 The 496 dual channel DSP lock-in amplifier module is utilized in chopped light (AC) measurements for signal recovery. 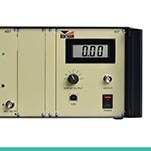 The 498 dual channel hybrid AC current pre-amplifier DC nanoammeter module provides a simple solution for two specific signal detection challenges. The DH PY PSU is used as the power supply for the integrated impedance matching amplifier housed in the DH PY pyroelectric detector. The CPS1M is a modular cooler control housed within the 417 mainframe unit used with thermoelectrically cooled photodiodes. The CPS20M is a modular cooler control housed within the 417 mainframe unit used with thermoelectrically cooled photomultipliers.